I knew it was high time to escape from the city and get my riding on when the seasons started changing and I had hardly ridden or enjoyed Seattle’s summer this last year. Really, I used to be proud of my riding and face. Lately, I started to feel like one of the fat guys that acts like he is still in shape because in high school (30 years ago) he was a football star. I’ve been consumed with getting AltRider off the ground for the last six months, rarely leaving the office and working around the clock, which has left little time for riding or anything else. 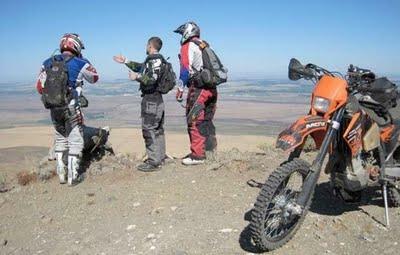 And it’s been a while since I have been a part of a proper enduro ride with the guys. The woods were calling me, my bike has collected enough dust over the last months and was in serious need of a workout, and so was I. The time was right, and I was definitely ready to get out of the office and join 10 other guys on a 6-day ride that Jim Thompson had put together for us. The planned route would take us from North Bend to the desert of Eastern Washington, north to Chelan and back. Jim Thomson, the mastermind and the organizer of the ride, riding a Honda XR650R. Tim Hollenbeck, Jim’s childhood friend, riding a KTM 525. Collin Graham, the rider I’ve known the longest, riding a KTM 525EXC. James Dean Anderson of JD Jetting riding KTM 530 EXC. 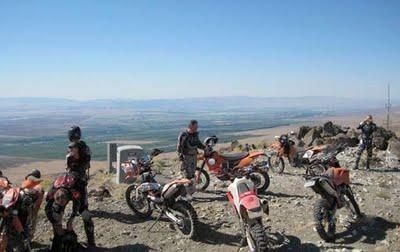 Rob “The Terror” McLeod, who won the Tim Hollenbeck “Terror on 2 Wheels” Award for Heart and Determination, riding a KTM 400XC. 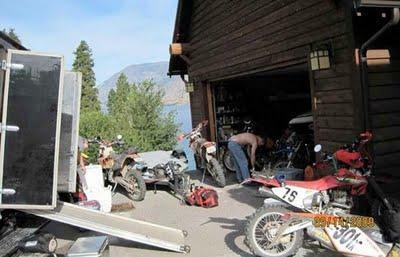 Jim Stouffer aka “Captain,” our chase truck driver, “rock star and all around good guy,” who also rode a KTM 530EXC on parts of the ride. Jim Connor, the multiple International 6 Day Enduro finisher was on a KTM 400XC. 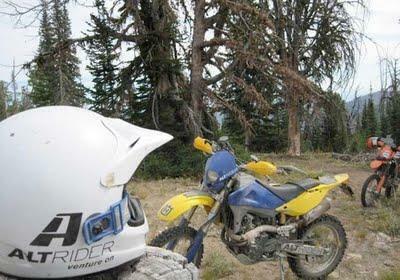 Ed Thierret who came on at day three in Cashmere, riding a Honda CR 230F. Bob Morrell riding KTM 690 who left after day two. Ken Shepard, local photographer, who joined us for one day on his KTM 200XC. This was definitely not an event for the tame-hearted and not your typical dual sport ride (hell, I wouldn’t be going on it if it were!). We covered 805 miles in six days, riding hundreds of miles of single-track, on some of the most amazing mountain trails the Washington wilderness area has to offer. Some trails were very technical and others I would describe as “cliffs” (properly named “Goat Peak”, “Mt Clifty”, “Blowout Mountain” and such) with little room for error. 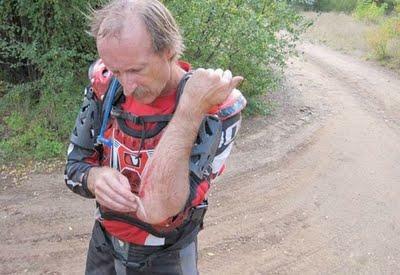 The days were long and hard and the trails demanding. Not everyone reached the finish line, some suffered minor injuries, nasty falls, and/or mechanical problems, but it was indeed an epic trip, and a special time with the guys. The pictures of the beautiful mountain surroundings, the memories of sitting around the campfire exchanging stories from the day’s ride, and our ability to still be able to enjoy the trails and places that are open to us for riding, – no doubt about that, we need to ride while we can! Dinner at Jim’s house, riders’ meeting and loading up of the chase truck, which I missed. I came up with the most amazing, awe-inspiring new dual sport accessory while working late at AltRider because that is ALL we do (um, okay, fine… I just caught up on emails and prepped my busted bike). I arrived to Jim’s house 6 A.M. in the morning for the start of the ride. Vantage to Mattawa, to Table Mountain. Camping at Table Mountain. Incredible night at 6,800 ft; haven’t seen stars like this ever before. And that was also my first time seeing the space station at night. 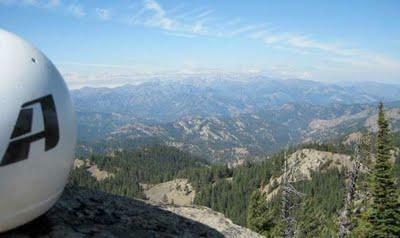 Table Mountain to Mission Ridge, to Chelan 25 Mile Creek. Time to reflect and write. Chelan 25 Mile Creek to Devil’s Backbone, to Peshastin. Staying at the Timberline Lodge. Owner Lizzy was extremely helpful and cheerful. Peshastin to Tronson Ridge. Lunch at Mineral Springs. Miller Peak to Taneum Creek. Camping at Taneum Creek. Taneum Creek, Mt. Cliffy. 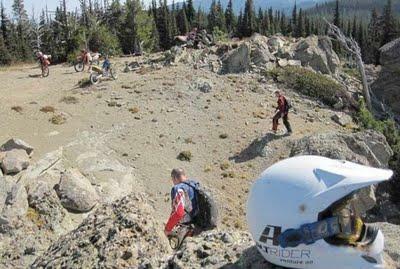 Three surviving riders return to North Bend.